I help people learn to detect deception. It’s a valuable skill set to have. Equally important is to learn why there is deception in a relationship. To get a reward or something they desire. Many relationships have deception mainly due to fear of being judged and rejected or the desire to avoid conflict. It’s a common understanding that it’s rarely only one person’s fault when there’s infidelity. (Feed your spouse at home, so s/he’ll never have to eat out). That’s a whole separate post. But the point I want to make is that a lie also rarely includes only one person. Deception generally involves a mix of the person telling the lie because the truth may entail being vulnerable or admitting selfishness, and the person receiving the information. Let me pause before you start crafting your hate mail about this post. As you’ll see above, I am talking about generalities. Of course, there are always exceptions to the rule. Absolutely, sometimes there is an innocent party who did not contribute to the rich-with-lies environment. I am referring to high stakes, relationship lies, not white or insignificant lies. Instead of immediately being pissed, hurt, or disappointed, take a breath and try to find out why they felt they needed to lie to you in the first place. Would the lie teller know based on experience, that you’d flip your lid, yell, scream, storm out, temporarily or possibly permanently? How do you feel about the idea of Better Late, Than Never? Perhaps this person has been wrapped up in the lie for so long, they feel the window to come clean has been long since shut. 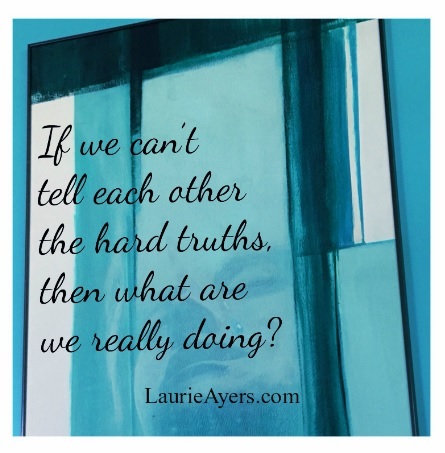 To those who lie, or have offered up a high stakes lie to a loved one: If you can’t tell each other the hard truths, what are you really doing in the relationship? It’s not based on trust and honesty. To those who have been, or will be lied to: Try to respond, not react. A response is calm, thought out; a reaction is often knee-jerk and sometimes not very pretty. If you need to take responsibility for any involvement in creating the environment where the other felt the lie was necessary, own it. A high stakes, relationship lie is rarely as simple as the liar being the bad guy and the lie-ee, being the victim.